You are a very talented surgeon. 6 month later and very happy! Thank you sincerely for your wonderful care. You have treated me with such kindness. Thank you so much for doing such a great job. I look at myself in a whole new way. Thank you for making the experience painless. You have a wonderful God-given talent. I thought all of you were extra caring. I could not have asked for a better work environment. You did the most amazing job. We are so happy we chose your office. I am very grateful to have someone like you in my corner. You were so amazing to me. You are all an amazing, professional, and dedicated team. Thank you for your care and concern. You are certainly excellent at your profession. My mind was at ease just knowing Dr. Wells was in charge. I’m assuming in an updated, future version of those etiquette books, it might list how the appropriate way to thank someone for your “mommy makeover” should go — but for now, I’m not sure how to completely express my gratitude to my dear surgeon for a new and improved mid-section! Thanks so much for being excellent at what you do and caring so much about how you do it. I really couldn’t have done it without all your assistance with the preparation. 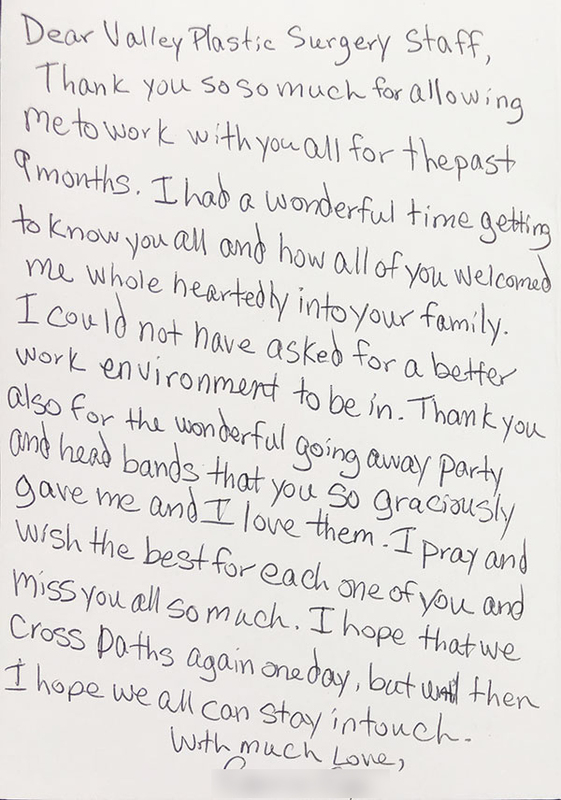 I appreciate your professionalism, as well as your family-friendly care and compassion. Thank you for helping me feel better about myself! Thank you for taking me on as a patient. I am very happy with the results of my breast reduction. Also, please extend a “thank you” to your staff. They were very nice and made me feel comfortable. I could not have asked for a better experience, or better results! Thank you all so much for your help. I could not have asked for a better experience, or better results!!! I am so happy that I decided to have the surgery. My only regret is that I did not have the surgery sooner! All my friends and family are amazed at how good I look, and how natural I look! I am appreciative of the professionalism and kindness of your practice and staff. I am so thrilled with the result from my procedure this past spring. It is such fun wearing new pants and skirts. I finally feel confident with my shape. I am appreciative of the professionalism and kindness of your practice and staff. Thank you! I could not be happier with my results! Words cannot adequately express how very happy I am with my new breasts! I have wanted these breasts my entire life. I absolutely love them. They are uniform in shape and size and just the perfect size for me! You are amazing! Thank you so much! We love you, Dr. Wells! How can we thank you? We are so very grateful. Thank you for your kindness. We can say we love you. Thank you for always going above and beyond for me. What would I do without you? First — you changed my life with hopefully my last surgery (no growth yet!). And now a year and a half later you are still taking good care of me. Thank you for always going above and beyond for me and for all our mutual patients. You are truly an angel! I am blessed to have you in my life. My entire experience was very positive! Thank you so much for the wonderful care I received before, during, and after my stem cell fat transfer. With almost no pain, my recovery has been easy. I obtained exactly the results that I wanted, due to Dr. Wells’ skill and expertise. I look like myself, only better! Tess was amazing, professional, and compassionate. The entire experience was very positive! My face reflects the feeling of youth and vitality that is the REAL me. Virtually all of my mother’s family had very droopy eyelids as they got older. I always hoped that mine would not have this characteristic. That was not to be. I actually did not become too concerned until I began getting obvious bruising on my forehead by underestimating the height of low hanging objects such as kitchen cabinets and the tops of doors when entering vehicles. I saw my ophthalmologist because I was worried that my previous retinal detachment had somehow permanently compromised my vision. Needless to say, I was anxious to the extreme. The doctor determined that my droopy eyelids were blocking my peripheral vision to the extent that I was constantly injuring myself just doing normal daily activities. He recommended that I see a plastic surgeon to remove the excess eyelid tissue (blepharoplasty). He also recommended that I have a brow lift. I saw Dr. Wells for a consultation. She showed me “before and after” pictures of women in my age range (decidedly over 60!) and I was so impressed with the dramatic improvement she had achieved with those patients. I had also heard about a new “thread” facelift that was minimally invasive. She had specialty training in that area and provided a lot of helpful information about that procedure, as well as, the more invasive facelift. After much soul searching and consideration of the pros and cons I decided on the eyelid surgery and the thread facelift which included the brow lift. 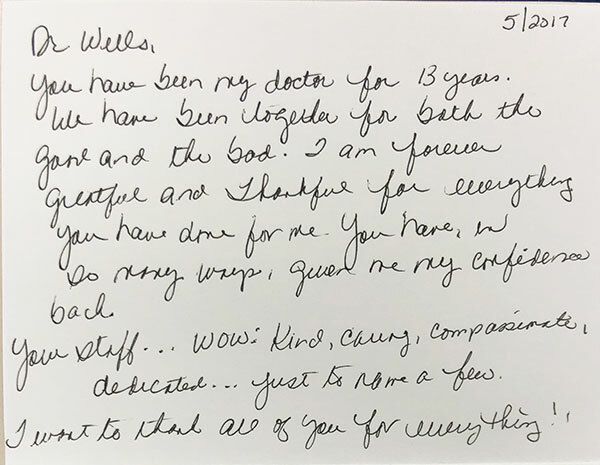 Dr. Wells was very supportive of my decision and was genuinely interested in my fully understanding the procedures and what to expect from the surgery. She did the procedures using local anesthesia and made sure I was comfortable the entire time. I was and am absolutely delighted with the outcome. My vision is no longer compromised by my droopy eyelids (no more forehead bruises!). I love the general appearance of my face with the thread facelift, even after several years. My friends tell me that I look “rested” where before the procedures I was frequently asked if I was tired or if I hadn’t slept well. I do intend to have the traditional full facelift in the near future and absolutely want Dr. Wells to do it, but it was just not what I wanted at that particular time in my life. Dr. Wells understood that and worked with me to come up with a plan that was thoughtful, reassuring, and comforting. Now, I have a result that I love and my face reflects the feeling of youth and vitality that is the REAL me. Thank you Dr. Wells, for helping me love what I see in the mirror! After several years of enjoying my refreshed and rested appearance that Dr. Wells gave me with my eyelid lift and threadlift, I decided to move forward recently with a facelift. Dr. Wells had explained to me during my very first consultation that a lesser invasive threadlift would be a more temporary and less dramatic solution to my sagging jowls and neck. I knew that I needed more “restoration” now. All I can say is “WOW!” I have avoided buying necklaces for years because I was self-conscious about drawing attention to my neck. Now, I wear one every day because I love the way my neck looks! To say that Dr. Wells knows the face is an understatement. I never imagined I could look this much younger, but also so natural and age-appropriate all at the same time! Thank you Dr. Wells for helping me love what I see in the mirror! Dr. Wells is professional, yet loving, caring, and compassionate. Dr. Wells truly has a gift! She is professional, yet loving, caring, and compassionate. The respect she has for her patients goes over and above physician’s etiquette. A huge thank you to Dr. Wells and her welcoming staff for their genuine care that made my experience very comfortable. "Thank you all so much for your help. I could not have asked for a better experience, or better results!!!" "Words cannot adequately express how very happy I am with my new breasts! I have wanted these breasts my entire life." "Thank you for always going above and beyond for me and for all our mutual patients. You are truly an angel!" At Valley Plastic Surgery & Medi-Spa, we welcome you and look forward to providing compassionate care and effective solutions for your cosmetic plastic surgery and med spa needs near Baltimore. Please call (410) 628-8200 or use the following form to contact us today.